The Monastery of Cimiez, which includes a church, a cemetery and a convent where some Franciscan friars still live, is located in a residential area in the hills above the hustle and bustle of the city. The convent houses the Musee Franciscain which is decorated with 17th-century frescoes, and exhibits a monk's cell so visitors can get an idea of how the austere religious life is lived. The chapel dates from the 17th century and the lovely gardens have sweeping views across Nice. 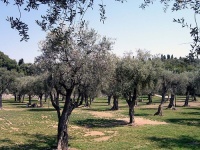 Apart from the monastery, the grounds of Cimiez include a large park set amid olive groves, the Archaeology Museum and Matisse Museum. Also within the gardens, the Musée National Message Biblique Marc-Chagall displays some 450 of the artist's oils, drawings, pastels, lithographs, sculptures, and ceramics. There is plenty to see and do in this picturesque area, which promises visitors a break from the bustle of the city. During a couple of weeks in August, Cimiez is the site of the Nice Jazz Festival, with music being played every day until midnight and performed on three stages, in the olive groves and the Roman Amphitheatre. It is an hour's walk, or a short bus ride from the town centre.